I feel like everyone on Facebook has been exclaiming “We’re so excited to share that we are expecting!”. Seriously there was one day when 3 different women had something like that as her status. Except I’m not very close with the people who have shared their baby secret lately. They are people I know from college but it’s not like I would be invited to their baby shower. They are diaper cakes and you can really put anything inside of them. Diapers (obviously), towels, onesies, and in the middle of the larger layers, you can even shove in a bottle of baby powder or some bath stuff. 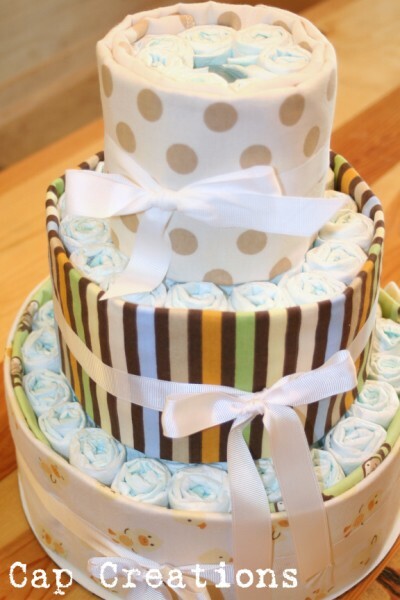 For this cake, she layered the diapers with receiving blankets, which is a really cute and colorful addition. Love!